Built-in color changing program with 10 selectable speeds. Weight 4 lbs. Size 6" x 8" x 7.5" WHITE housing & brackets. 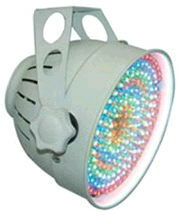 * Please call us for any questions on our led par 196 color splash light rentals in Ft. Wayne IN, Warsaw, Syracuse, Auburn, South Bend, Indianapolis IN.